Embracing the warm welcome that the pineapple symbol has long represented, Grand Pineapple Beach Resorts, with two locations in Jamaica and Antigua, offers guests an authentic and affordable Caribbean experience that begins with the best beachfront locations. 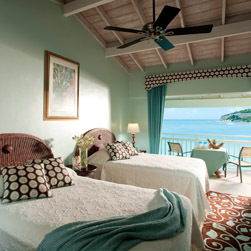 Grand Pineapple Beach Resorts accepts everyone—singles, couples, families, and groups. All-inclusive rates include accommodations; all meals and snacks; unlimited premium-brand beverages; non-motorized watersports; and nightly entertainment. Colorful accommodations, abundant and delicious food and an unhurried charm make Grand Pineapple Beach Resorts a tremendous value.